For a book or movie review to have any credibility, there has to be some balance. In other words, no review should be completely negative or positive. Even if the reviewer absolutely loves what he is reviewing, there must be some criticism, and some call for improvement. Otherwise, the review is tacitly claiming that the book, movie, television show, or anything else that is being reviewed is flawless. On the other hand, a sneering, lopsided attack is rarely warranted and is usually an excuse for the reviewer to spew some venom and show off how clever he thinks he is. Unfortunately, the state of reviewing today would lead you to believe that there is an awful lot of perfection out there. Unwarranted praise, low standards, and an unwillingness or inability to thoroughly critique are some of the main problems. Why is this so? First, there are an awful lot of people out there--mainly online--who have no idea what they are talking or writing about. They have basic emotional responses to what they read and see. Without any knowledge of character development, narrative, or any other aspect of writing or film-making, they simply have nothing worth saying. Their comments are no different than a 12 year-old's description of a movie. When you can't articulate exactly why you have an opinion on something, your comments lose credibility. Second, numerous reviewers offer up their views as a brazen quid pro quo. They may be getting paid to shamelessly provide a favourable review. Or they simply review positively because they want to maintain access to those who give interviews, provide admission to various junkets, or otherwise make the life of a professional reviewer worthwhile. If those individuals are writing for high-profile media outlets, their opinions can influence others. Third, as time goes by, there are fewer opportunities for paid reviews in the world of newspapers and magazines. The demise of Kirkus Reviews is another example of that. When reviewers are paid for their time to write a well-researched review backed up with relevant and insightful comments, the quality is generally better. Finally, there is no accounting for taste. It is hard to fathom the rubbish that is embraced by so many people. This is not so much an indication of the lack of good reviewers as the fact that numerous individuals simply have different standards, and like different things. The average length of reviews must surely be taking a hit as well. Pithy reviews that are hardly more than a synopsis and a rating are becoming the norm. But all is not lost. Though the amount of worthless garbage on the internet is unlimited, the overall availability of good information on books and movies continues to increase. In the online world, some of the best and most thorough reviews can be found on amazon.com. Unfortunately, like a microcosm of the vast online universe, to find those reviews, you will have to wade through a lot of dross. Disingenuous tripe that has been planted by those associated with the work that is being reviewed is also a problem. One of the best high-profile professional movie reviewers remains Roger Ebert. The most well-known and "successful" person in any field, especially one in which writing is the medium, rarely is the most thorough, knowledgeable, and entertaining. Ebert is an exception. He still makes the effort to provide reviews that are entertaining in their own right, and often extrapolates and riffs off the themes in the movie he is reviewing. And if you're a regular reader of Ebert, you are sure to read references to other movies, books, and even great music related to whichever film is the focus of the review. When ready-made and easy-to-follow narrtatives come screeching to a halt, many people don't quite know how to react. In 1995 I was living in Tel Aviv when Yitzhak Rabin was murdered. The night is burned in my memory. There was a nice chill in the air, and a political rally in support of the Oslo peace process was being held a few kilometres away at the Kikar Malchey Israel (Kings of Israel Square). I half-heartedly urged some friends that we should head down to take in the event. Instead, we settled for a night at the local pub. A few hours later the word came out that Rabin had been shot. There were two palpable, collective pauses that night. The first was after everyone knew the shooting had taken place, but there was still little information available regarding Rabin's condition. A short time later the worst possible outcome was realized: Rabin was dead. After news that Rabin was dead, rage quickly grew. Everyone was certain was that there was going to be a war, the assumption being that an Arab had pulled the trigger. But still, the officical word had to come down so that the rage could be consummated. When the news broke that, in fact, a Jew had put five bullets in Rabin's back, no one knew quite how to react. A wrench had been thrown into the narrative. This is what I am reminded of as the story of a police officer stabbed to death in Ottawa has evolved today. The rightful mourning for the fallen officer, Eric Czapnik, started in earnest as soon as the horrible details started to come out. An officer writing some notes in his car outside an Ottawa hospital was attacked by a knife wielding maniac and stabbed to death. But things took an even worse turn when we learned that an RCMP officer, Kevin Gregson, had done the killing. The sadness and mourning will not be diminished for the many people who are affected by this killing. But somehow, while it's all a bit more repellent and vile, the rage won't be channeled quite as easily and purely as it would have been if the killer had been a career criminal. The hatred would have been white hot, the calls for revenge greater, and the ease of attacking the courts for lenience (the RCMP officer who did the killing pulled a knife and threatened someone a few years ago) would have been unhindered. This will be much harder for police officers to deal with. The details of this story will take some time to come to light. When you consider the secrecy and closed nature of all police forces, it's easy to imagine that the RCMP, at least, will do its best to keep the public in the dark about what exactly happened here. The RCMP officer who did the killing was on leave due to the previous charge he faced in 2007, and surgery that he underwent to remove cysts from his brain. Czapnik was at the hospital on an unrelated call when he was attacked and killed. What was Gregson doing at the hospital? Did Gregson know Czapnik? In other words, was this personal? Was Gregson treated more leniently in 2007 because he was a member of the RCMP? Besides determining exactly what happened, the interaction between the Ottawa police and the RCMP will be interesting to watch as this story unfolds. Various media outlets are salivating at the thought of a mob drama to rival any of the cinematic versions after the son of one of Montreal's Mafia bosses was gunned down in broad daylight on Monday, December 28th. The logical conclusion is that there is going to be instant retaliation and then all hell is going to break loose, with a steady supply of corpses to fill up nightly newscasts and the kind of melodrama that appeals to all segments of the viewing audience, from the wealthy to the white trash. So-called experts on the Mafia scene in Canada have been consulted and the shocking prediction from one is that "There will be, for sure, a retaliation." And in a demonstration that art and life are often similar, the victim was standing near a car as he was gunned down. Mobsters in the movies and TV often seem to take out their rivals as they are getting into a car. Why exactly is that? When someone is getting into a car, they are preoccupied and vulnerable. As some oaf lumbers out of a restaurant with a gutful of pasta and bends down to unlock the car door, he is less likely to be able to fight back, or flee. A mobland murder often involves a hitman from out of town to decrease the likelihood that he will be caught. License plates on a car are another way to confirm that the correct person is being targetted. A random location outside decreases the possibility of physical evidence and also narrows the number of possible suspects. On the other hand, when someone is killed at or near a location that he frequented, other regulars from the vicinity, both strangers and those who knew the victim, can provide evidence and be interviewed, thus increasing the chances of finding the killer. But if the murder of a mobster in Montreal and those killed in the movies bear any resemblance, the similarities end there. Because it's a guarantee that the murderous criminal Mafia thugs, who are often treated with a sick kind of reverance by the media, don't utter a steady stream of clever witticisms and hip aphorisms, do not lead lives in three tidy acts, and are not sympathetic characters in the least. When Nicolo Rizzuto's brains oozed out of his skull and dirtied the snow on a street in Montreal, it marked the violent end of the kind of person society romanticizes far too often. Whether the killing will spark a mob war in Montreal remains to be seen. 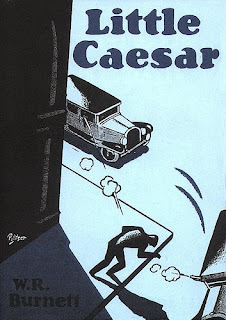 So you read this old, relatively obscure crime novel--Little Caesar. It's got that kind of hipster cachet that comes from the fact that not many people have read it. But at the same time it's often hailed as the first real crime noir novel. It's about Chicago mobsters of the 1920s, and a movie based on the book was made in the 1930s. You start reading the book and it doesn't really grab you at first. Sure, there's cool slang from the era. Like a gun is called a "gat" and gangsters say things like "I don't wanna get my neck stretched" (i.e., get done for murder and sentenced to death--they still hung people in most states back then). Almost everyone has a nickname. Some gangster's girlfriend is called Seal Skin, and someone else is called Big Boy, there's a Scabby, a Blackie, and a Killer Pepi. And even the main character, Rico--that isn't his real name. You don't find out until near the end of the story that his real name is Cesare Bandello. But you keep reading because the book really isn't that long. And generally when people say good things about a book, you tend to take note and think that there must be something to it. The book creeps up on you. You realize that it's written in a way that isn't as easily accessible as today's crime novels. That doesn't mean it has dense sections with long sentences. In fact, it's very straight forward with sparse writing and tight dialogue. It has a kind of rhythm that might take readers of today a while to get accustomed to. It's just that W.R. Burnett wrote things that writers of today don't write. What about the story? It's about a group of mobsters in Chicago. It focuses on an up and comer named Rico who grabs the leadership after he has been around for a while and he helps pull off this caper, see? So Rico, this bird who's the boss on this caper, pops a bull, and then takes charge of the gang in Little Italy. Then the noose slowly starts tightening on him as he realizes that as soon as you're at the top there are going to be others gunning for you. And you can never rest. Just as quickly as he make his move, he is on the run after one of his gang turns soft and gives it up to the bulls, see? He doesn't want to get his neck stretched, so he moves on to get away from the heat. It's about the protracted lives that criminals of that sort lead. The fact that they know that the end could come at any moment, but there's nothing else to do but keep living like that. It is also about how different characters deal with the reality of the life they have chosen, and how they react when the heat is on and the prospect of life behind bars or the death penalty looms. A grim kind of fatalism comes through in how different characters face down the inevitable: some choose to die in the streets in shoot-outs with the police, others would rather run and try to begin again in another city, while others have had enough and accept that they are going down. The dialogue and the characters are the book. There aren't many descriptive passages here. And aside from the mobsters there isn't any real sense of the Chicago of the 1920s in which the novel takes place. He had none of the outward signs of greatness. Neither the great strength and hairiness of Pepi, nor the dash and effrontery of Ottavio Vettori, nor the maniacal temper of Joe Sansone. He was small, pale and quiet. "Gonna stick to your dago buddy, are you? Well, he's got the jack. But what're you gonna do when you need a guy that's got the guts?" "What do you know about guts? I guess you ain't so tough or they wouldn't've run you out of Chi." "Will you listen to that!" said Red. "All right, buddy, you said your piece and you sure spoke out of turn. Why, dago, where I come from you wouldn't live five minutes. Now I'm gonna show you how they treat smart dagos in Chi." Red made a motion towards his coat pocket, but Rico beat him to it. He pulled his gun from the holster under his armpit and covered Red. "Red," he said, "in Chicago I wouldn't let you rob filling-stations for me." Red stood with his hands up, looking from Rico to Chiggi. "Don't bump him, Louis," said Chiggi. "I wouldn't waste a bullet on him," said Rico; then glaring at Red he went on: "You been getting away with this rough stuff too long, Red. I'm Cesare Bandello!" A decent book, most memorable because of the long-gone, seemingly authentic world that it depicts, and because it was the first of its kind. Breaking Bad is an AMC drama about Walter White,(played by Bryan Cranston) a 50 year-old chemistry teacher who has been diagnosed with lung cancer. With the prospect of a few more years of life at the most, White is distraught at the thought that his family will not be left with anything after he passes away. White's brother-in-law, Hank Schrader, is a DEA agent in Albuquerque, New Mexico, where the show is set. After hearing Hank talk about the methamphetamine problem in the area, White asks to go along when a meth lab is being busted. Later, White approaches a former student and proposes the idea of cooking crystal meth in order to get some quick money. The student, Jesse Pinkman, played by Aaron Paul, quickly agrees. The cancer diagnosis is the final straw for White in many ways. He has led a life of conformity and fear (something that he states outright in numerous discussions with other characters). He has been less than successful—settling for a life as a high school teacher as his former friends went on to successful careers as highly paid chemists. One story-line that gets some play during the first two seasons details how White’s former partner and fellow chemist took formulas that they developed together and launched a company, becoming extremely wealthy in the process. White has always given off an accepting and good-natured exterior, while probably cursing himself at the same time. As he embraces the role of cooking meth, and accepts the fate that he is not long for the world, he also starts lashing out at the kind of arrogant, self-serving behaviour from others that he always accepted in the past. White swings so far in the other direction, however, that by the end of season two, it's hard to characterize him as anything but a nasty piece of work (albeit conflicted about the recent decisions he has made). He is barely able to maintain his cover in front of his family, completely alienating his pregnant wife Skyler as season two draws to a close. But as with all great drama, despite the things White has done, most viewers will still find him likeable and will root for him in most situations. White and Pinkman start at the bottom of the meth food chain, working with two-bit punks, then nastier individuals, and finally hooking up with big-time distributors. With great dialogue, superb character development, and a few strong themes throughout, every episode and scene ratchets up the tension and results in a fantastic viewing experiences. 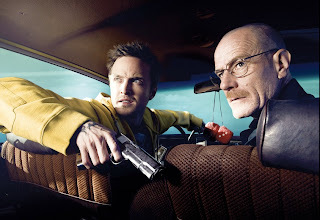 Whether White and Pinkman are involved in a showdown with some drug-world nasty, or there is a taut moment involving personal interactions of the main characters, the result is entertaining and always pushes the narrative forward. How people deal with fear and pain, and the fact that the consequences of what people do can be wide ranging are two of the strongest themes in the show. Every character is dealing with their own demons, and they all keep secrets from the people who should be able to help them the most. Walter White is the most obvious example. A secretive person to start with, White does everything in his power to prevent his family from discovering how he is making money to pay for his cancer treatment. White’s wife, Skyler, starts contemplating an affair with her boss, and begins sneaking the occasional cigarette, even though she is pregnant. Another character, Sklyer’s sister Marie, shoplifts. Marie’s husband, Hank, harbours a great deal of fear about his job, but hides it behind the bluster of his stereotypical, loud, guffawing, good 'ol boy exterior. But even as people go into themselves to deal with their suffering, the things they do to salve the pain often affects others as well. Another theme that receives a lot of play, is how people in despair often feel that there is nothing more to lose. The horrible realization is that things can always get worse, and there is no limit to human suffering. This is very reminiscent of the Paul Bowles book Let it Come Down, in which the main character moves to Morocco after a failed life in Britain, and slowly spirals into a nightmarish situation. The writers of the show inserted religious imagery into various scenes in the second season. This reviewer saw many more examples than I was aware of (they seem obvious after someone points them out). The fear of some viewers is that there will be a sharp turn towards religious themes in the third season, and this may result in thinly veiled attempts at preaching right and wrong and a complete change in the show. At the same time, the religious imagery fits in with the dual nature of most of the characters—all of them are battling personal problems in some way. And none of them seem to be able to find solace in their friends and family. There is an apocalyptic ending to the second season that has many wondering what direction the show will take in the upcoming third season. Will White start recognizing how far off the rails he has really gone? Will he finally have to pay in some, real, consequential way for all the misery he has caused? Only time will tell. White's character goes so far over board in his behaviour, committing numerous murders, and choosing not to help someone as they lay dying, that you have to assume that there is going to be some kind of reconciling. Some kind of horrific realization of what he has turned into, followed by redemption seems like a possibility in the coming season. I don't particularly like the cold open in which they often (but not always) give a glimpse of what is going to happen later in that show or later in the season. Of course, as the writers of the show say, it doesn't always go in the exact direction that the little glimpse might lead people to believe. But, the show is too good to need something like that. In the world of cinematic and literary police forces, writers usually choose to depict them as incompetents or geniuses. In Breaking Bad, it's hard to believe that the police have not been able to draw a straight line to White and his rather blundersome attempts at becoming a local drug distributor. However, the power of the show means that most viewers won't give this much thought. The performance of Bryan Cranston as Walter White is one of the driving forces behind the show. He puts on a stunning performance in the first two seasons. Like may great performances, you truly feel that he was made to play this role. But as with all great acting, it's only a fantastic script that allows such a performance to come through. Breaking Bad does a great job of dealing with suspension of disbelief. This is largely down to the great storylines, dialogue, and performances from the actors. The absurdist humour that comes through also helps dispel those “as if” moments that could destroy a show that didn’t have the same level of quality as this one. After 2 seasons and only 20 episodes, this show is already a classic. For fans of Breaking Bad, the much anticipated season three can’t begin soon enough. 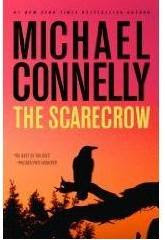 When a skilled writer gets lazy, the result is a novel like The Scarecrow by Michael Connelly. When you have built up a solid fan base and are guaranteed a fat payoff for every book you are commissioned to write, it must be tempting to churn out a top-of-the-head, subpar effort that is full of clichés. The plot is basic here. A sexual deviant, who also happens to be a skilled hacker, butchers women and frames up other people using his computer skills. Planted evidence on other people's computers, and hacked e-mail and credit card accounts are some of the tricks he uses. A journalist, Jack McEvoy, becomes a major part of the story after he and a new reporter discover that the suspects taking the fall for these crimes are innocent. In the first sign of pure laziness on the part of the writer, we have that at-first omnipotent bad guy, who can do absolutely anything to anyone because of his computer hacking skills. But we are never told how he does all these things. A criminal hacking into e-mail and credit card accounts, planting evidence on other people's computers, and accessing other personal information stored online is, of course, plausible. But at least give us a semblance of an explanation as to how this is being done. Here there is nothing of the sort. The major problem with this book is that the characters are paper-thin. As a reader, you give not a damn about what happens to them, because you have absolutely no sense of who they are. There is no character development, of either the good guys or the bad guys. Oh wait, there is a few paragraphs-long, laugh-out-loud bit of tripe that is supposed to inform us about why the central creep does the things he does. Pure, well-used cliché here—the individual's mother was a stripper. Take a wild guess what the result is—yep, he hates women and starts butchering them. Books with a serial killer of some sort always hinge on the fact that everything the killer does has a significant meaning which then allows the cops (or journalists) to cleverly figure everything out due to the references that the killer drops along the way. As if the killer really wants this to be a cat and mouse game, and/or wants to give the cops a legitimate chance to find him. This is something that readers of crime fiction put up with to a degree. But when there are so many other weaknesses in a novel, this kind of boiler-plate becomes even more annoying. Connelly is either aware of the third-rate book he is offering up to his readers, or he subconsciously lets on through the words spoken by the characters. There are numerous "tells" in the book in which the characters try to head off the inevitable reactions that readers will have. "It was strange, sometimes, how life worked out." Strange too how a line like that will make an implausible plot twist easier for readers to swallow. "She said it so matter-of-factly. There was probably nothing in this world that surprised her or horrified her any longer." The flat, meaningless reaction of this character to the discovery of a corpse just doesn't wash. That's what happens when characters aren't developed. The things they say sound strangely inappropriate and unbelievable. In the section that attempts to give the killer some back-story: "He wondered what had made him go down the hallway to look. He knew the answer was tangled down deep in his darkest roots. In a place no one could go." And in a place that no reader will go, because there is no reasonable insight into his personal history or psyche, and hence no understanding about why he turned into a killer. "I didn't know exactly where I was going but I drove with subconscious purpose, as though the hands on the wheel and the foot on the pedal knew what my brain didn't" I.e., a meandering, unfocused arc to the book that indicates a lack of planning. "This doesn't sound like a plan, Jack. It sounds like you're making it up as you go along." A huge hole in the plot appears as the two main characters, McEvoy and his FBI agent girlfriend Rachel Walling, head to the organization where the killer works. At this point in the book, the story about the serial killer has received huge publicity, with McEvoy's name part of the story, his face on CNN etc. Yet they blunder in to the office and use their real names. Another major absurdity involves the FBI agent first being fired and then reinstated. Another failing, and what brings so many books down, is the lack of resistance that is developed in various situations. Things just happen without the requisite opposition from situations or characters. And in another crime novel cliché, there is the false ending, where the journalist and cop believe that the case is wrapped up but the real killer is still on the loose. As a reader, it is unlikely you will care at this point. The book isn't a total write-off: there are some reasonably interesting passages. However, these sections involve McEvoy and Walling discussing the case and telegraphing the main plot twists. Another sign of a weak novel. Are there any themes at play in this novel? I doubt it. And even if there were, they wouldn't salvage this substandard effort. There is no flesh on the bones of The Scarecrow. Save yourself some time, and give this book a miss. The LA Times Homicide Report is fascinating for a number of reasons. The sheer, non-stop parade of senseless murders is probably what brings most people back to the blog. It's hard to comprehend that such violence plays out so consistently in one geographic area. But there it is, every day, with new reports of lives ended. Ostensibly, as mentioned in its About page, one of the motives behind the Report is to chronicle the deaths of every single person murdered in LA county. In the past, many murders would go unreported. The race and socioeconomic background of a victim often determines how much play a murder gets in the Los Angeles media (and many other jurisdictions as well). So, the Report tries to address that failing of the mainstream media. And it makes a pointed effort to include the race of everyone murdered within LA county. If one goal is to give a name to every single murder victim, then the Report succeeds in that respect. But unfortunately, just as with the thousands slaughtered every year in various conflicts around the globe, you feel desensitized to the overwhelming nature of it all. I just can't force myself to feel for most of the victims, as much as I would like to. This sense that a person should feel something but isn't quite able, is what drives people to set up those sad tributes to high profile murder cases, or the deaths of famous people. It's as if the act of leaving a teddy bear for someone you never knew will convince yourself and others that you are a caring person. The narrative that surrounds the murder of a stranger is what determines whether or not you feel something. Which is an indication that, despite the humanity that should exist between fellow humans, it doesn't. Unless of course you know the individual who was killed. Or the script contains all the necessary elements so that it elicits empathy. Which is why we should all recognize the importance of the arts in helping us to feel something about people whose deaths would otherwise be meaningless to us. Books, movies, music, paintings—they are not just distractions, they help us to feel. Which is also why the homicide report posts that include the most detail and use narrative elements more common in fiction are also more likely to make readers feel something. The occasional homicide report victim does get to me. There is usually some kind of bathetic element in the write-up that makes it real. Something that makes an image rise up in my mind of this person as a living, breathing individual who was cut down for some meaningless slight. Gomez, 92, was a neighborhood fixture, still spry enough to walk the streets for exercise in the mornings, picking up recyclables for extra cash as she went along. On Feb. 2., 2006, she left home dressed in a layer of clothes topped with a red jacket, and pushing a cart to carry cans and bottles, as was her routine. Somebody stabbed her repeatedly and left her body in front of an apartment complex at 9034 Willis Ave. just south of Nordhoff Street and west of Van Nuys Boulevard. Of course, there is another reason the report is so popular.When you read about tragedy befalling others, it has the odd effect of increasing your sense of well-being by making you realize that something horrible hasn't happened to you. Yet.